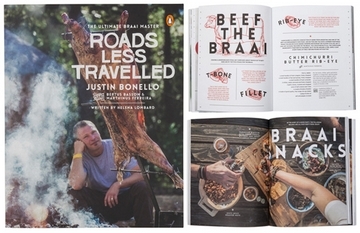 To celebrate the arrival of Justin Bonello's new book, Roads Less Travelled – The Ultimate Braai Master, we're sharing one of our favourite recipes from the book, Bertus Basson's braai pizzas. Italian food made the African way. Combine the flour and salt in a large mixing bowl. Activate and dissolve the yeast by placing it in another bowl and adding the warm water. Give it a stir, and sprinkle a handful of flour over the mixture to prevent the yeast from forming a crust. Leave the yeast mixture in a warm spot for about ten minutes or until it begins to froth and gradually add it to the flour, mixing it well until it forms a dough. The only way to do this is with your hands. If the dough is too sticky, add a bit more flour; if it's too dry, add a splash more water, and so on. Knead for ten minutes until the dough has a smooth, elastic consistency. Sprinkle some flour onto your work surface, place the dough on the flour and cover with a damp tea towel. Leave the dough to rise for about 30 minutes or until it has doubled in size. Sprinkle some flour on a clean working surface and tear off a fist-sized piece of dough. Using your fingers or a rolling pin (or a bottle of wine) roll the dough out into your preferred size and shape – keeping in mind it can't be bigger than your braai grid. The border can be slightly thicker if you like a thick crust pizza. Bertus didn't do a tomato base, but used olive oil and sliced garlic instead. This is Bertus's favourite topping, but the possibilities are endless, so go wild. Take the pizza base and put it on a grid over moderate coals. Braai the base for a couple of minutes, or until the bottom is crispy and golden and the top starts bubbling. Flip the base over and brush the top with the garlicky olive oil. Take out a couple of the garlic slices and arrange them on top of the pizza. Next, scatter sliced mozzarella on the base – as much as you like. Reduce the heat of your coals slightly by scraping some to the side – the slow heat will give the mozzarella time to melt without burning the bottom of the pizza. Go ahead and drizzle some more garlicky olive oil onto the pizza, then once the cheese has melted, remove the pizza from the heat. Top with red onion, tomatoes, Parma ham, basil, rocket, Parmesan shavings and season with salt and black pepper. Cut into odd-sized slices and let your friends dig in (once you've had your slice). Then let them each make their own pizza.